Success is a beautiful thing … but for St. Augustine’s University, unparalleled success means it’s time to start looking for a new track coach and athletic director. The favored Falcons’ men won their fourth straight NCAA Division II Outdoor Track and Field Championship on Saturday, scoring 85 points to obliterate Tiffin University and Texas A&M University-Kingsville, which tied for second with 36 points at IMG Academy Track and Field Stadium in Bradenton, Florida. “I thought the men would perform well, but I didn’t expect them to win like they did,” said George Williams, who coaches both the men and women’s track teams and has more national titles in track than any coach in any division. The Falcons’ women, ranked No. 3 heading into the meet, finished as runners-up to Pittsburg State University, in a competition decided by the meet’s final event. The men’s victory represented the 38th national championship for Williams in his 40-year tenure at the school, where he has also served as athletic director since he returned to the Raleigh, North Carolina, campus after the 1996 Olympics. Williams’ goal is to retire after his 40th national championship. While his resume includes titles in men’s and women’s outdoor track and men’s and women’s indoor track, he also coached cross-country at his alma mater until relinquishing those duties in 2015. He is also a mainstay with the U.S. Olympic track and field program, for which he last served as head coach in 2004. Other than the retirement mark, Williams, 73, says, he’s not counting. He said his retirement is actually tied to a promise he made to a recruiting class that has one year left. The men’s title and women’s near miss capped off an emotional weekend for Williams, a Miami, Florida, native who won a national championship in his home state for the first time in his career. It also brought the most trying season in Williams’ coaching tenure to a close — after the shooting death of the mother of senior Shamia Lassiter, one of Williams’ star sprinters, during Christmas break. That made the men’s victory somewhat tempered by the fate of the women, who entered the final event of the meet, the 4×400 relay, needing to place first or second to claim the championship or place third to share the title with Pittsburg State. The Falcons, instead, finished fourth in the race in 3:40.28, losing by .17 seconds to third-place finisher Academy of Art University (California). The tragedy regarding Lassiter’s family helped the team gel, bring friends and family to the meet and have one of the largest cheering contingents among thousands at the stadium. The Falcons’ men relied on their relay teams and depth for their victory. They had multiple qualifiers in the 100- and 200-meter dashes, the 800-meter run and the triple jump, scoring 57 points in those four events and 20 points in relays. Outstanding performers for the Falcons men included senior Burkheart Ellis Jr., who won the 200, finished second in the 100 and was a member of the winning 4×100 relay team. Junior Daniel Jamieson was fourth in the 200, seventh in the 100 and ran on the winning 4×100 relay team. Freshman Shaquille Dill, a native of Bermuda, and senior Immanuel Hutchinson were first and third, respectively, in the 800 and both ran on the winning 4×400 relay team. A victory by the women would have been the first outdoor sweep by the school since 2001 and the first women’s crown since 2002. The finish was the highest for the women in an outdoor meet since 2003 when they also placed second. The women’s team standouts included junior Tia-Adana Belle, whose time of 56.13 broke her own two-day-old championship meet record in winning the 400 hurdles. Belle, who was also on the 4×400 squad that placed fourth, will represent Barbados in the 2016 Summer Olympics in Rio de Janeiro. 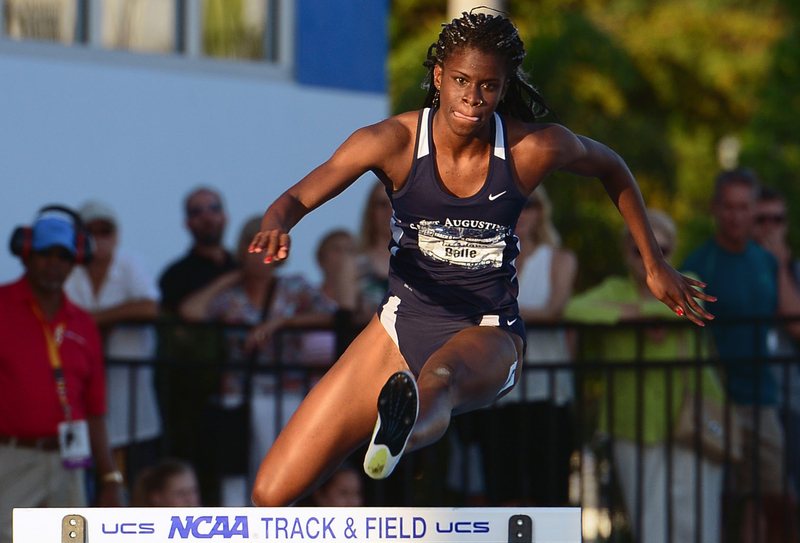 St .Augustine’s Tia-Adana Belle gets over a hurdle while running the 400 meters hurdles finals during the NCAA DII Track and Field Championships on May 28, 2016 in Bradenton, Florida, at the IMG Academy. Lassiter, a senior, finished second in the 100 hurdles and also ran on the 4×100 team. “Because I can be pretty hard on myself,” Lassiter said. Senior Ornella Livingston won the 100 and finished third in the 200. She was also on the 4×400 and 4×100 relay teams. Livingston, a likely member of the Jamaican Olympic team, had two other reasons to be proud. One, she didn’t practice for two weeks before the meet, because of an injury during the Penn Relays. And two, her mother Cynthia Bouglas, and big brother, Sean Miller, 40, attended the meet. Williams said the location — less than two hours from Disney World — might have contributed to the good showing by friends and family. But not Williams and his team. Many of his athletes and former athletes — including NCAA Division II Track and Field Hall of Famer and Olympic medalist Bershawn “Batman” Jackson — train with Williams’ track club, G.W. Express. Some student-athletes are eager to get back home for the holiday weekend and visit with family before resuming training in preparation for the Olympic Trials. They trust their preparation to Williams, who has coached 39 Olympians, including three gold medalists. “So we’re headed back to Raleigh, to North Carolina,” Williams said. And for some of them … on to Rio.